Konstantin Egorovich Makovsky is a rather diverse artist who has his own unique style recognized by experts and admirers of his work. As for this picture, called “Still Life”, the master here is inclined to use a genre that is not typical of himself, the so-called “pure”. It should be noted that the image of bright and light colors, directly against a dark background, was often performed by Dutch artists of the 17th century. Thus, for a long time, such pictures were a standard and model for imitation and correctness of plotting and arranging colors. The canvas leaves a vivid impression. A riot of colors and an abundance of colors that overflow a vase, fall down on the table, can personify wealth. In general, the still life looks complete and fairly high quality. You can see the smallest highlights, which shimmer on a vase, a very contrasting play of light and shadow. 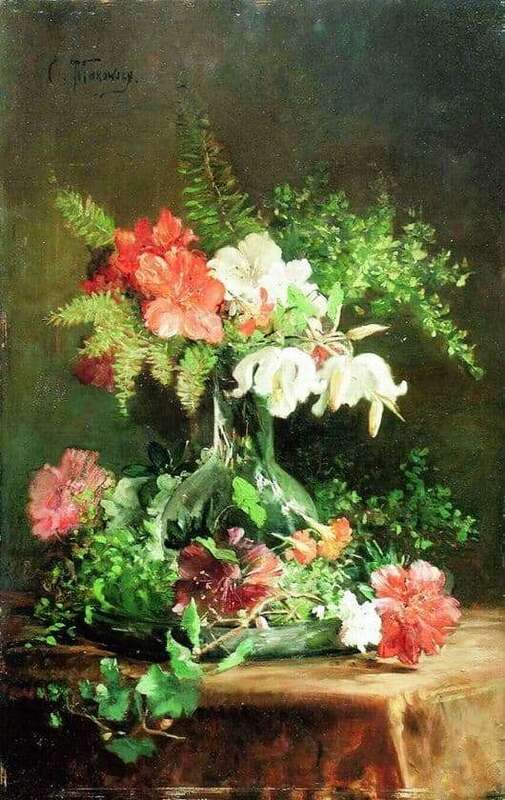 What is particularly interesting is how the master was able to accurately and realistically convey the refraction of light and the distortion of the image, looking through the glass of a vase.